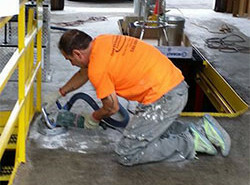 Looking for concrete grinding services for your commercial or industrial business? If so, you have come to the right place. At North American Coating Solutions, we offer a wide range of concrete grinding services to prepare for floor coatings and remove the dirt and debris on the surface of your floors. You can count on our concrete shot blasters and concrete restoration solutions to get your flooring in the best shape possible. See what our family owned concrete grinding business can do for you! Why spend thousands of dollars on concrete replacement when all you need is a fresh coat of sealant or epoxy? Our concrete grinding services will clear your concrete and create a smooth surface that stains, industrial floor paints, and other floor coatings can stick to easily. Whether you need concrete floor coating removal or just a simple surface cleaning, we have the concrete grinding tools to get the job done right the first time. 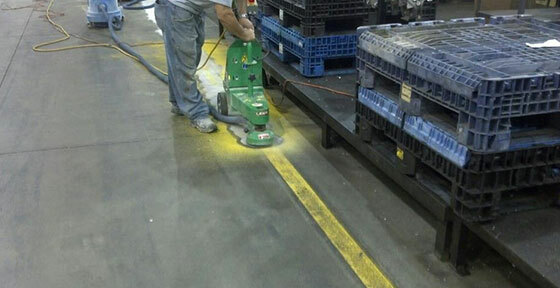 Maximize your investment by choosing concrete grinding and resurfacing for your industrial floors. 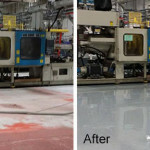 If you are interested in epoxy floor paint or other industrial flooring applications, we can apply our solutions directly over your existing floors. We use concrete grinding to sand down the surface of your concrete so the floor coating can grip better and last longer. Enjoy a 5 year workmanship guarantee on all our industrial flooring services that ensures your floors look their best at all times. With the right steps and the right concrete repair experts on your side, you will get years out of your flooring no matter what. Get the concrete grinding you need at a price that’s perfect for you. Call North American Coating Solutions right away for your free, no-obligation consultation.